Thank you to The Coca-Cola Company for sponsoring this post. All ideas and opinions are my own. I love everything about the summer. Warm weather, casual attitudes, outdoors activities, and the abundance of fresh, throw-it-together meals that I can whip up in minutes. No kitchen, no problem! 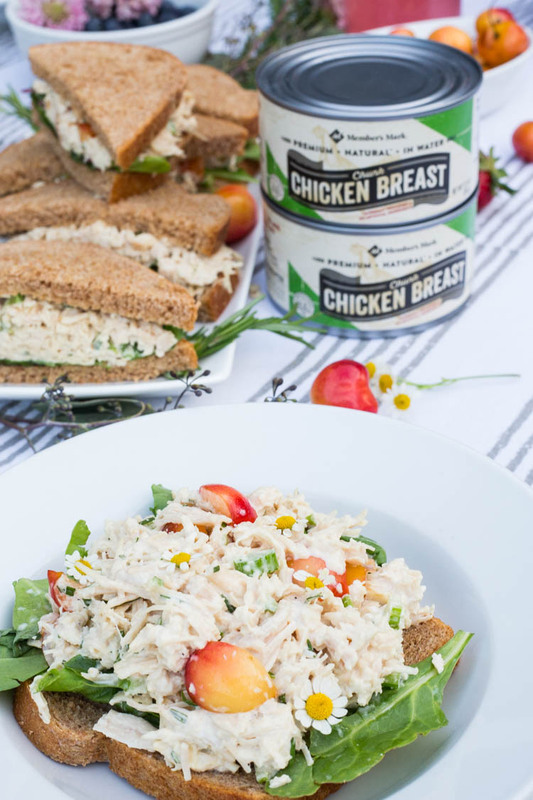 My favorite summertime meals, like this amazing Summertime Cherry Chicken Salad, can be made on-the-go with just a few ingredients and a bowl or two. 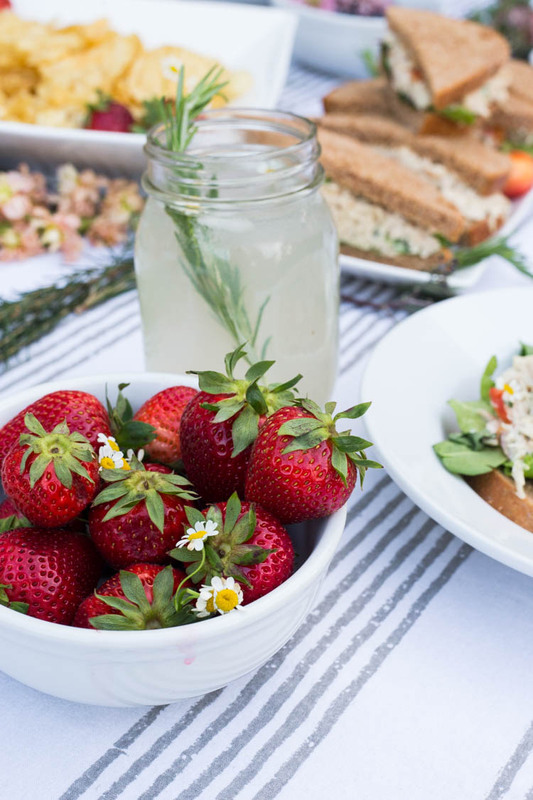 A summertime picnic spread doesn’t get much easier, more delicious, or more beautiful than this. 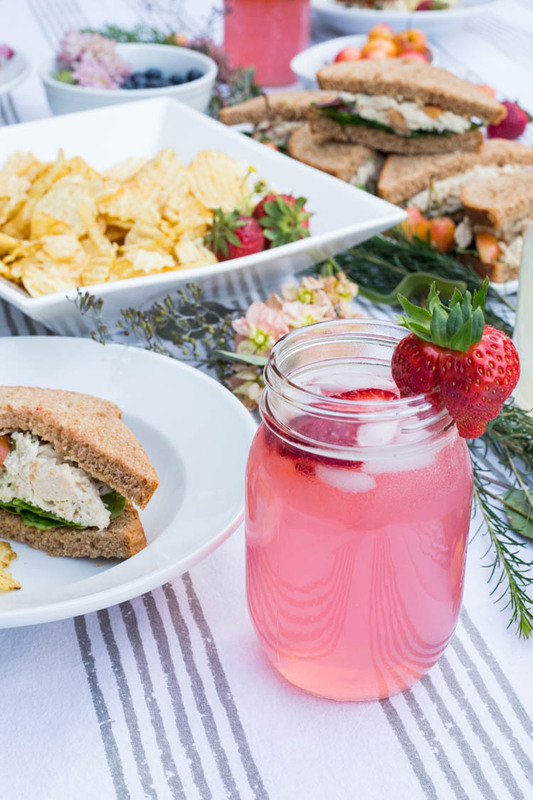 Cherry chicken salad, made in 10 minutes with Member’s Mark natural chunk canned chicken breast and some fresh cherries, piled thick onto soft wheat bread, then layered with chips, fresh fruit, some wildflowers, and accompanied by our favorite natural Hubert’s ® Lemonade. 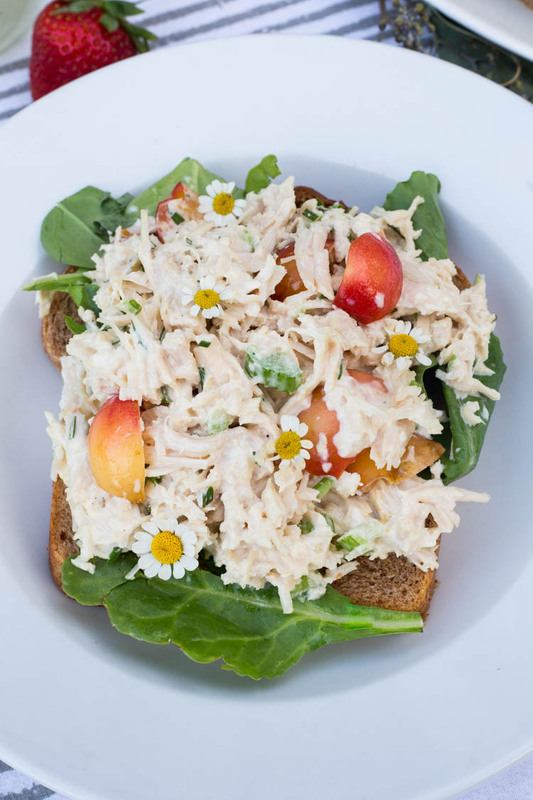 I have made variations of this chicken salad recipe for years, beginning back when I worked in a cafe in the mountains during college. I learned how the celery gives it crunch, a touch of dijon adds some kick, fresh rosemary makes it taste woodsy and cozy, and fresh fruit like grapes or cherries lend a sweetness that makes the whole thing sing. Using Member’s Mark canned chicken makes the whole recipe super simple, and the moist, chunked chicken has great flavor and texture. Find the whole recipe at the bottom of this post. 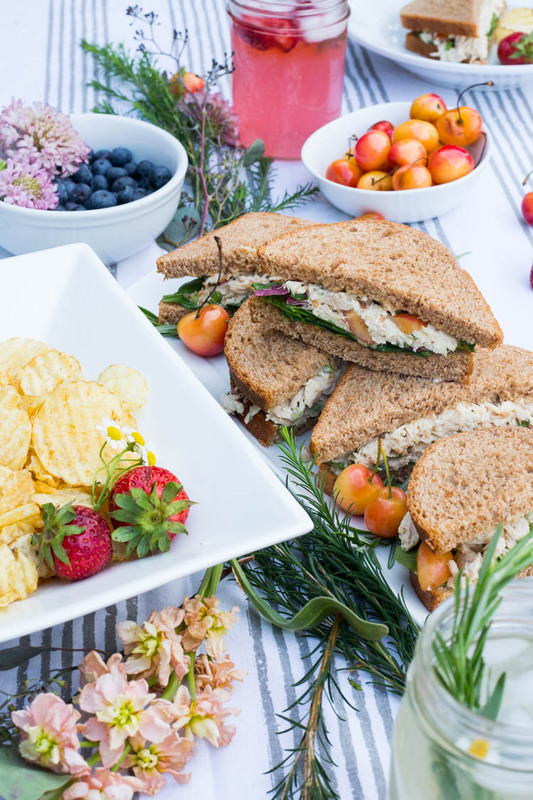 When I was shopping at Sam’s Club for the ingredients for the picnic, I spotted a bag of fresh cherries and decided to sub them in for the usual grapes in the chicken salad. Oh my, was that was a good decision! Fresh cherries feel so much like summer, and the texture and subtle sweetness was so delicious in the sandwiches. We’ve also been eating leftovers of the cherry chicken salad as a chunky dip for chips. It is really good. Sam’s Club is hosting a summertime sweepstakes, in addition to featuring tons of fun summer recipes and ideas. Visit the 100 Ways to Summer hub right here to enter and be inspired! 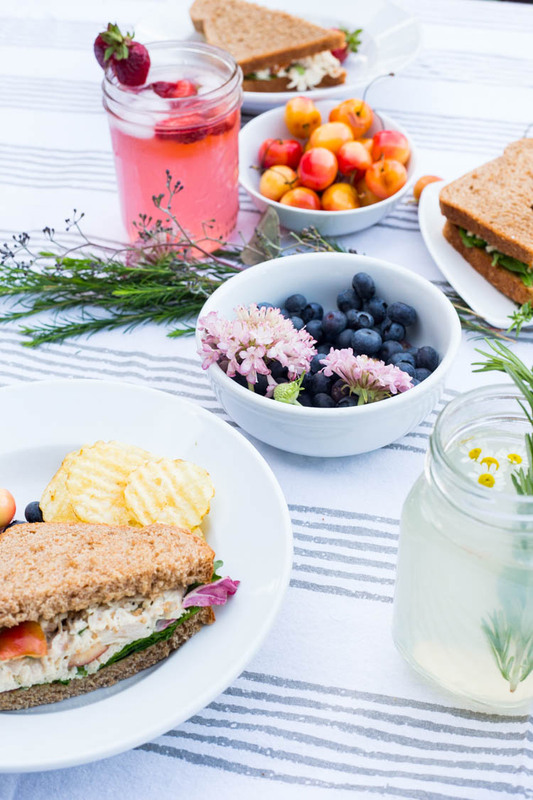 These sandwiches can be made ahead, wrapped up and taken along on a hike, or served fresh in a backyard picnic or party. Add to the spread with bowls of fruit and a sprinkle of wildflowers. I hold the firm belief that everything is better with some fresh flowers and greenery, so I try to incorporate them into all of my tabletops and projects. 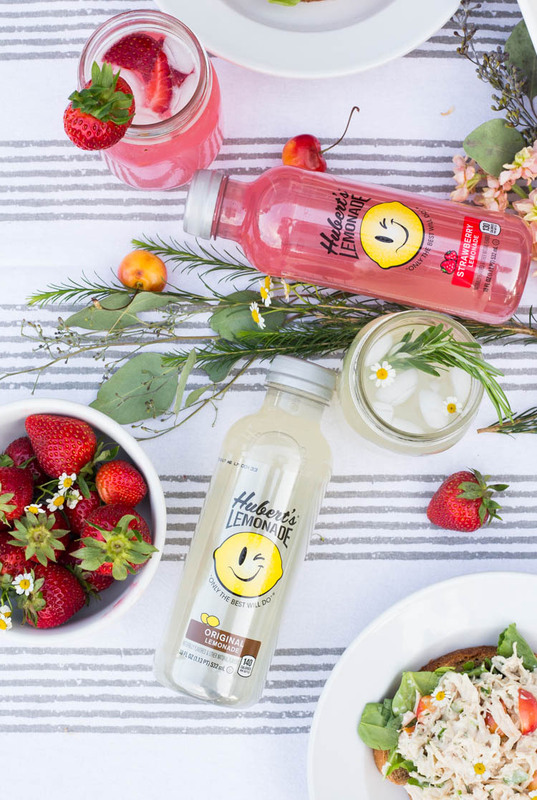 Hubert’s ® Lemonade tastes like homemade, and can be poured into cups and dressed up a bit with a sprig of herbs or some floating flowers. I loved adding some fresh strawberries to the strawberry variety. 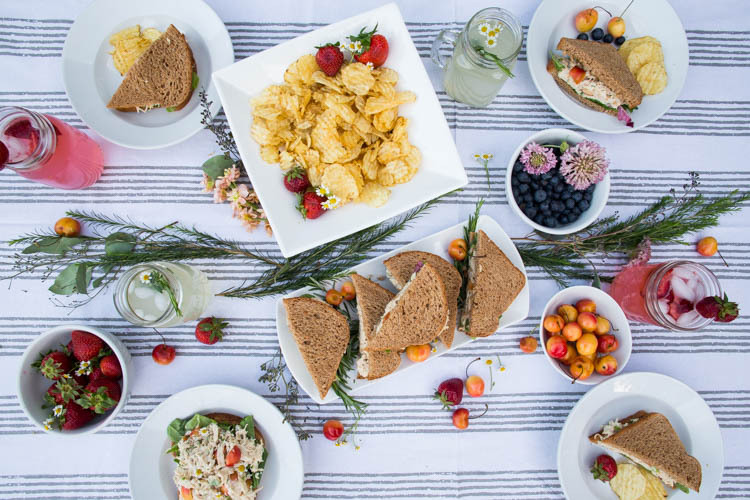 After throwing together this simple, summertime spread I felt ready to host a party or a shower. 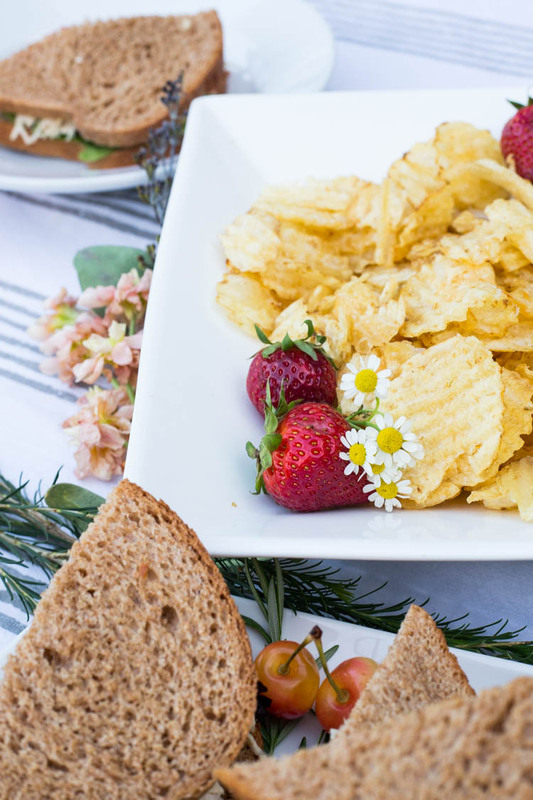 The simple cherry chicken salad, chips, fruit, and lemonade seemed like such a perfect picnic for entertaining friends! The whole meal was easy to make and easy to love. When cherries are out of season again, and we head back towards the fall, I’ll still make this delicious recipe using grapes or dried cranberries instead. It can be modified to suit your tastes and the season pretty easily. You can bet I’ll be enjoying it this way until the cherries disappear for the year, though. You should probably make some soon, too. serves two people, can easily be multiplied to serve a crowd. Add all ingredients into a bowl and mix thoroughly with a fork, breaking up chicken chunks as you mix. Pile high onto soft wheat bread over a bed of optional spring greens. Enjoy!